3. if im not on and you make a charry PM me it so i can accept you (the auto accepting has gotten out of hand and i cant keep track of everyone. and some ppl i dont even know what they look like! my mistake there! 5. as many charries as you can handle!! Location : C-eh? N-eh? D-eh? A? Age: 3 and half years. Pic: Do I have toooo? Personality: She is good, kind and gentle, through and through. History: Fell in love with an older taken male as a younger wolf, but grew up regretting never telling him how she felt. She still has strong feelingd for him and wonders if he'll ever feel the same. Personality: He's kind and caring, and very humorous. History: He's always known how Gem has felt about him and has always looked out for her. Personality: he is uncaring, selfish, and bloodthirsty. History: Born as a loner, his parents left him. He was caught and stuck by chains. Being so strong he broke free, the chains still attached to his body. He now roams in the evil pack, bloodthirsty. Blade sniffed the ground, his beady eyes red like blood. He scowled, as usual, and stomped around. He laid down against a tree trunk and huffed, closing his eyes. Gem walked along the new territory, Hawk at her side, with his maate beside him. Gem looked up at Hawk and blushed lightly. History: Her parents always kept her safe when she was a pup, but now she has to live by her own and its very tricky for her. Other: She may like blade, but its hard for them to be in different lives. 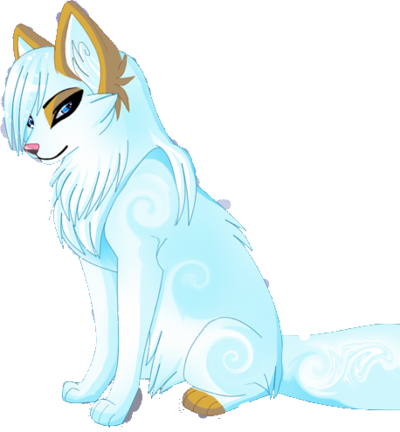 Blade shook his fur and trotted around, his eyes soft squints. He was tired. Angel licked her paw and sighed. 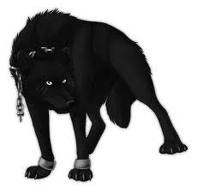 Blade ruffled his fur and looked down at his chains. He sneered, but inside, he was hurting. Angel closed her eyes and breathed softly. Blade thrusted his head toward her. He murmered and walked off. Blade barked at one of them. The wolf grinned at rushed at ice, dragging her away. "More..." Blade muttered. Ice yelped "what are you doing!?" The wolf dragging her laughed. "You heard him, like everyone else whos afraid...we put them in the fear cage. But all you will find are girls.." he grinned and trotted with her in his mouth. He threw ice in large cage with other females. "Welcome to the human trap. Hope you like it. Blade chooses when females come out and in. Good luck." he trotted away. Blade stared at the ground, not sure what he just did. He felt weird. Angel opened one eye and looked at the newcomer. She huffed. Ice looked at Angle "hi"
Ice looked down "how long have you been living here?" "I lost count." Angel said fast. "It doesn't really matter, he never lets you out. Only to be used as breeders..only if you are afraid...of him..." She whimpered. » The Iron Wolf in "Brotherhood of the Wolf"